Thomas D. Rabjohn was born on February 19, 1970 in Sierra Vista, Arizona to Thomas and Ila “Patty” Rabjohn. He served in the United States Marine Corps as a Rifleman from 1989 to 1993. In 1996 he entered the Arizona Army National Guard first serving with 1st Battalion 180th Field Artillery as a Fire Direction Survey Chief. He was married to Nikki, and had three daughters, Kylee, Koree, and Kelsee. He deployed in support of Operation Enduring Freedom on 30 January, 2003 with the 1/180th FA Security Force. In May 2005 he was assigned to the 363rd EOD Company. 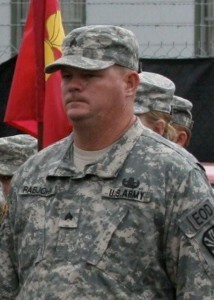 He was selected as an EOD Team Leader in May of 2008. He deployed a second time on 18 February, 2009; leaving his family and employment as a Phoenix Police Officer. SSG Thomas Rabjohn was killed in action on 3 October 2009 while attempting to disarm an intricate series of IEDs in Wardak Province, Afghanistan. His awards include the Combat Action Badge, Bronze Star Medal (“V” Device), Purple Heart Medal, National Defense Service Medal, Army Achievement Medal, Marine Corps Good Conduct Medal, Army Reserve Component Achievement Medal (two oak leaf clusters), Armed Forces Reserve Medal (Hourglass and “M” Device), Afghanistan Campaign Medal, Global War on Terrorism Service Medal.